Any time I’m home to visit my family, we’re always feeding a big crowd. Generally we stick with what we know—grilled burgers or chicken, taco salad or nachos, soup and chili, or something similar. But every so often my sisters and mom and I put our heads together and come up with something different. When I was home in July, we had one night where we were only going to have like 15 people—a considerably smaller crowd than our usual 25 or more. 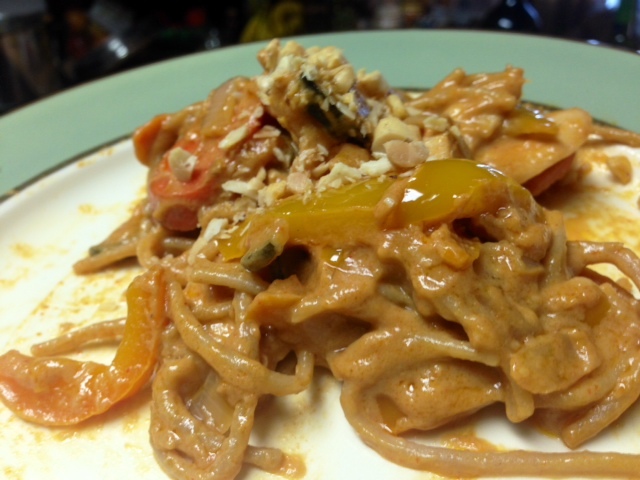 My sister and I decided we were really craving Thai food, so quickly had Mom poke through her cabinets to see if we had the makings for a Thai peanut sauce pasta. Since my mom’s cabinets are better stocked than most small grocery stores, we had almost everything we needed. Beyond the basics of the sauce recipe, we totally winged it (wung it?? 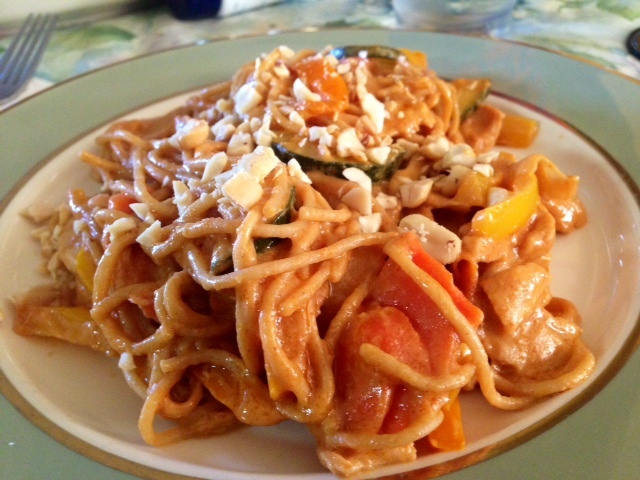 ), adding all the delicious flash stir fried veggies we could find, chicken, and whole wheat noodles. This dish was meat, carbs, and veggies in one, so we knew we had to make enough to get the whole hungry horde through dinner. And it was definitely a hit! There wasn’t even a spoonful left after supper, the pan was scraped clean. Combined with the moist strawberry shortcake I made for the big group, I think everyone was stuffed. Chop up all your veggies and put them in a big bowl so you’re ready when you need them. 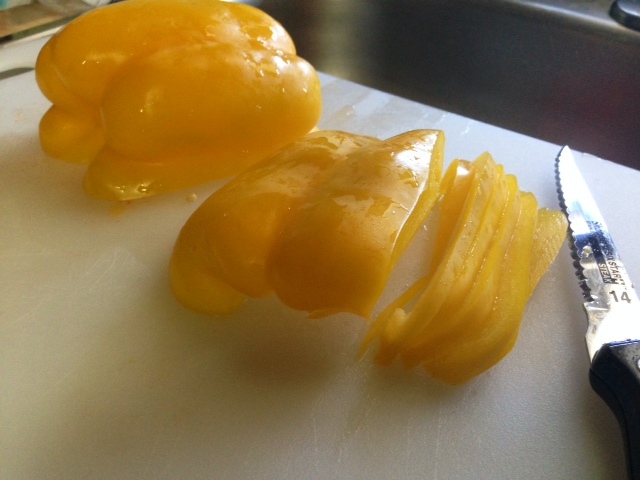 You want them all to be fairly even in size and thickness so they’ll cook evenly and quickly. My sister swears by cutting the carrots on a thin diagonal, so we humored her. They were good, can’t vouch for doing them the other way though. Combine all the sauce ingredients except the sesame oil in a LARGE pan or skillet, and bring to a very gentle boil over medium heat, whisking constantly. Once it’s boiled, turn the heat down to low and let the mixture simmer for 3-5 minutes, being careful not to let the mixture scorch at the bottom of the pot. Add more coconut milk as needed if it’s too thick (keeping in mind that when you add the noodles they’ll soak up some liquid). We didn’t have enough coconut milk in cans, so we just used the unsweetened kind that comes in a cardboard box that we put in smoothies. 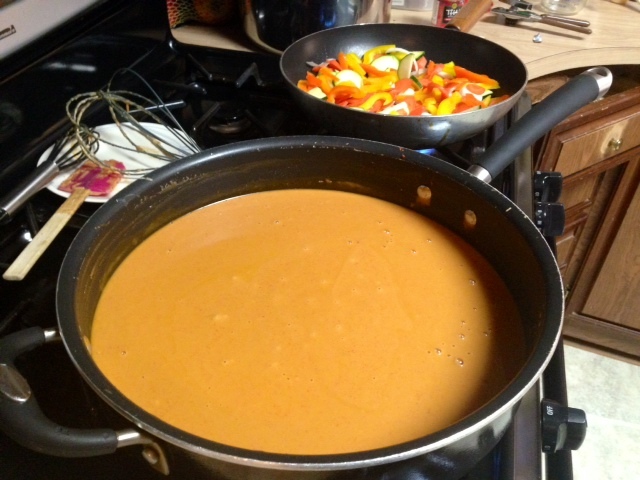 Make sure to taste a little of the sauce and adjust any of the ingredients as necessary according to your personal tastes (more peanut butter, more coconut milk, a little more sugar, etc.). Go ahead and boil the water for the pasta and cook according to the directions, but drain the pasta when it has a minute or so left. You want it a little firmer than al dente, since it will cook a little bit in the sauce as well. 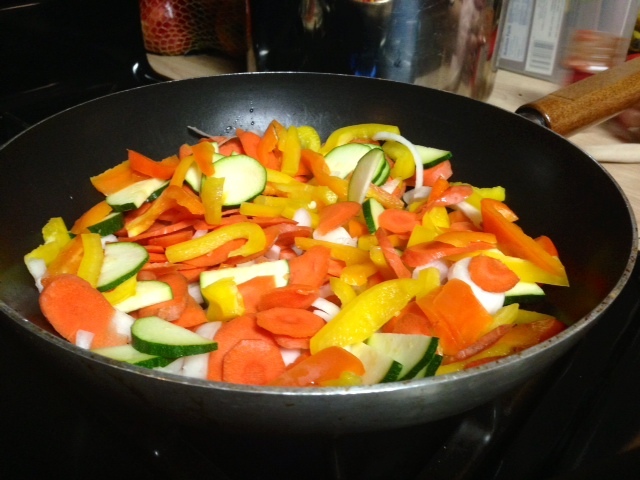 At the same time, stir fry up the veggies in a little bit of oil, and season with a little salt. You want them to soften up a little bit so they’re edible, but don’t need them squishy. Think of the bright crunch you get from a stir fry. Cut the chicken thinly and against the grain (so it doesn’t get tough), then add to the sauce and turn it up to medium. Cook the chicken in the sauce—it almost poaches it and picks up the flavors—stirring occasionally. The sauce shouldn’t be boiling here, if it is, then turn it down slightly. 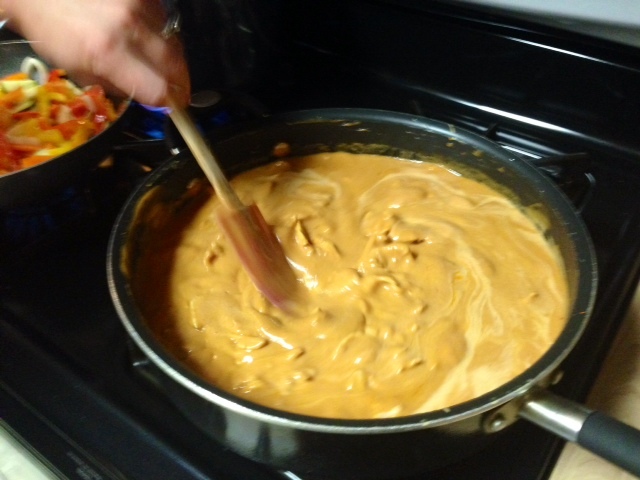 Our sauce kept getting too thick so we kept adding some more coconut milk (from the cardboard box) to thin it out. 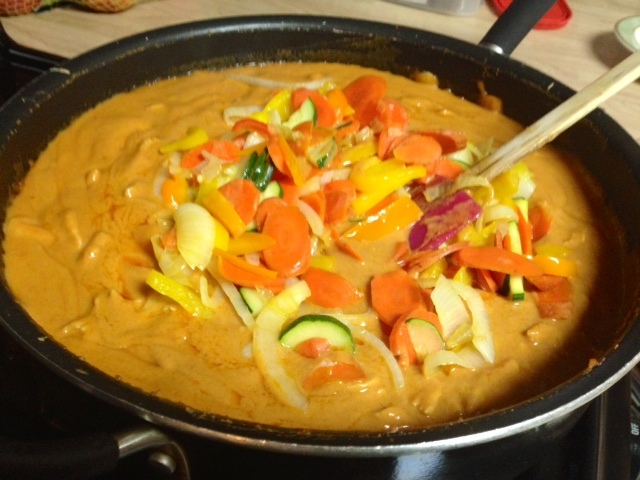 Once the chicken is cooked, add the vegetables and stir everything together. Let it cook for a couple minutes, and then add the cooked noodles. You can serve right away, or just keep it on the stove on low heat until you’re ready to serve. This gives the flavors a nice chance to get acquainted with each other. Ours cooked for an extra half-hour because the rest of our family members hadn’t shown up yet. 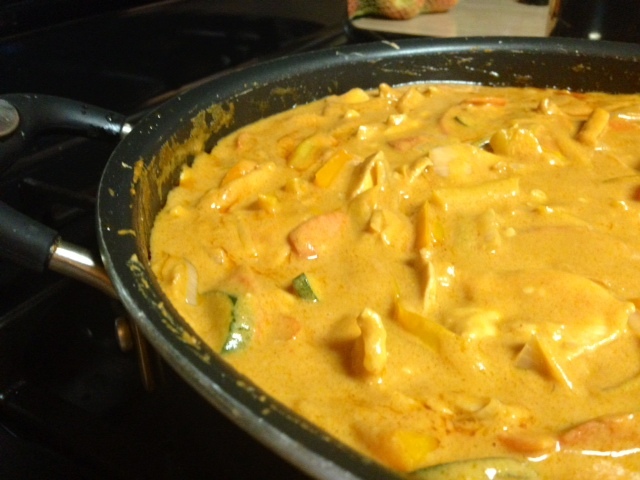 You may have to keep adding a little bit of the coconut milk to thin it out from time to time. Serve with chopped peanuts, and even some chopped green onions as garnish. We literally didn’t even have a bite left afterward, it was totally scarfed! Combine all the sauce ingredients (so not the veggies, chicken, or noodles) except the sesame oil in a large pan or skillet and bring to a very gentle boil over medium heat, whisking constantly. Let the mixture simmer for 3-5 minutes over low heat; be careful not to let the mixture scorch at the bottom of the pot. Add more coconut milk as needed if it’s too thick (keeping in mind that when you add the noodles they’ll soak up some liquid). 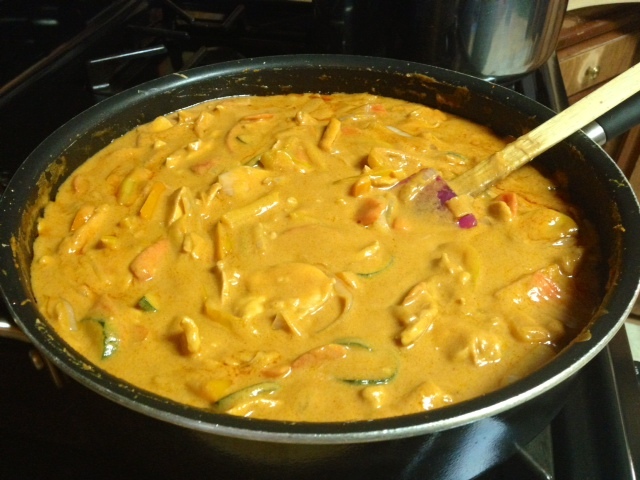 Make sure to taste a little of the sauce and adjust any of the ingredients as necessary according to your personal tastes (more peanut butter, more coconut milk, a little more sugar, etc.). 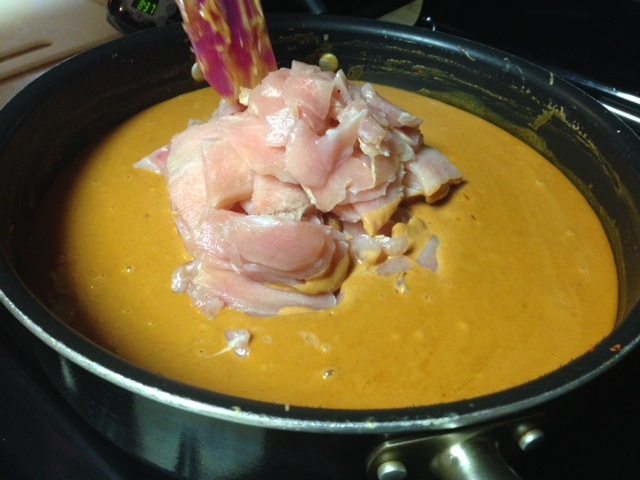 Turn the sauce back up to medium, cut the chicken thinly and against the grain, then add to the sauce. 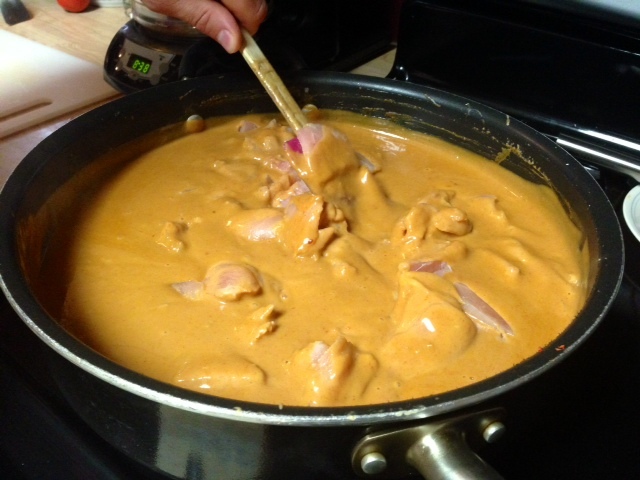 Cook the chicken in the sauce (it almost poaches it), stirring occasionally. The sauce shouldn’t be boiling here, if it is, then turn it down slightly. While the chicken is cooking, boil the water for the pasta and cook according to the directions, but drain the pasta when it has a minute or so left. You want it a little firmer than al dente, since it will cook a little bit in the sauce as well. Stir fry up the veggies in a little bit of oil, and season with a little salt. You don’t need them totally soft, but definitely not raw. When the chicken is cooked through, add the veggies and drained pasta to the large pan of sauce, and stir in the sesame oil as well. 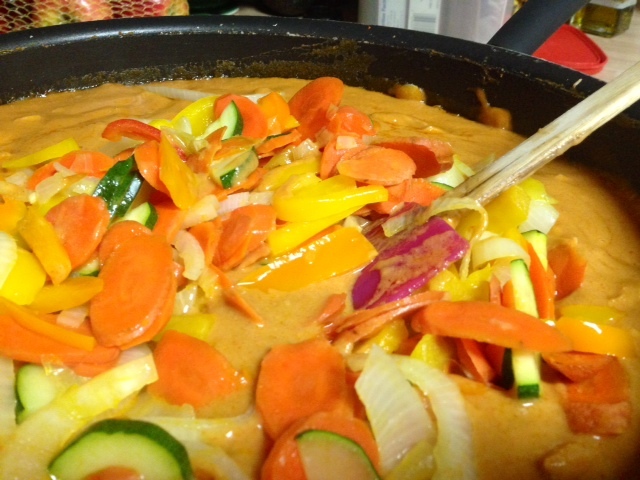 Continue to cook it on medium-low, and allow it to simmer on low until you’re ready to serve. Ours simmered for an extra half an hour since the rest of the meal wasn’t ready, and it just gave the flavors a chance to get acquainted with each other. Serve with chopped peanuts and green onion for garnish.